It's time for practical personal development! 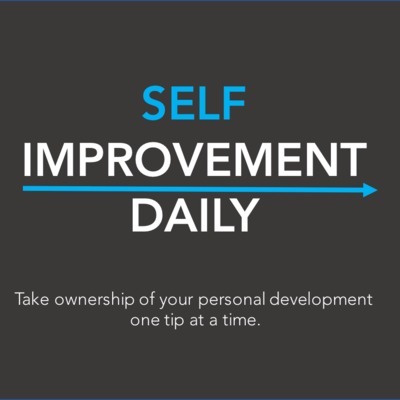 In just two minutes every day you can hear a new self-improvement tip that will help you get more out of your time, energy, and effort. Hosted by TedX Speaker and startup marketer Brian Ford, inch closer to your potential by opening your mind to new opportunities for personal growth! Listen to your first episode to hear what we're talking about, and be sure to subscribe to jumpstart your pursuit for personal development! You have what it takes to overcome any obstacle inside of you. Don't rely on external distractions, address the core of the issue internally. Set yourself up for long term fulfillment by minimizing regret. "Never Eat Alone" - A great tip from a timeless book about building out your network. Pushing the boundary is a tradeoff between danger and reward. How do you quantify it? A summary of the main points from this week's tips! What if I told you there is a psychological trick to getting started? Listen to find out! With a progress comes a positive outlook that you are taking steps forward! Who deserves recognition - your team, your colleague, or yourself? Greet each morning with a smile and energy! Get clear on how your daily activity maps out to your larger goals! There's no replacement for repetition and rehearsal! Choose Positivity - What's the Alternative? Originating as a medieval habit, this expression has a larger meaning than you may have thought! Lifelong learners will continue finding new frontiers! Some inspiration from a living legend! Self-awareness is key in understanding the best work-life balance for you. Choose to nurture yourself with positivity! A lesson learned from my mother! Did you know that 70% of good ideas come immediately after a bad idea? They are unconscious incompetent, conscious incompetent, conscious competent, and unconscious competent. Listen to learn more about it! That chips might be stacked against you, but it's unacceptable to use that as an excuse. "Fairy tales can come true, it can happen to you, if you're young at heart." A classy line from a Frank Sinatra classic! Go the full mile, and do that last 1%, because not everyone does. Cross your fingers to remember something. And listen to find out why! Will power is like a muscle. It can be grown with time! Your desktop is your virtual workspace. Take care of it! "Good things are coming. Can you feel it?" Just sit back and watch them play out! How did we get Zach to start waking up earlier? We addressed the core issue - Don't snooze! Find moments to think of others, and do something to help them out! Take criticism as constructive feedback, no matter who the source or what's the cause. What's better - less of something bad, or more of something good? Find your gift, then apply it to be impactful! As explained in this very meaningful story. Have a listen! How do events play out in your life - are you a byproduct of those events, or are they necessary steps on your path? Data is the truest feedback you can receive. Embrace it to make a change. Something thoughtful for a Friday! Where do you stand on these spectrums? "Don't stop dreaming just because you had a nightmare." Don't let a few setbacks get you down. Keep your vision alive with a belief that the best is yet to come! Passion and genuine interest will take you farther than anything else ever could. Embrace it and dedicate your life to doing something you love! "The best time to plant a tree was 20 years ago." Sure, it would be great if we could reap the benefits of our hard work immediately. But that's not how it works, or how it's supposed to work! If there is a lapse in communication, take responsibility for it. It will help immensely down the road! Be independent in how you evaluate your own success and your life will find more positivity. In order to find that right level / homeostasis, we need to figure out exactly where that is. Do it by testing! If something feels off, get to the root of it. We need to relearn to trust our instincts! This is a great technique for dealing with problems / concerns in an unemotional state. You can be a part of important things when you prioritize them in your life. Make an effort! It's a day to love everyone! A Lesson from Finding Nemo - "Just Keep Swimming"
No matter how daunting the road is ahead, put your head down and continue forward progress. This tip is inspired by Ellen Degeneres. Think of your grocery store habits - what do you do? Make the decision that is best for the group, and admit fault when necessary. We each have a unique story to tell. Don't hold back! "Every day is a fresh start, start the day with an open heart." A fresh start is the clean slate we need to build a great day. Summarize. Connect. Action. Skills that will help you in any relationship! Ever have a tough time getting yourself to get that workout done in the morning? Try this! Avoid "I Will 'X' When 'Y' "
Sometimes our internal dialogue rules us out from the onset. Be smart about your goal setting and motivation! The energy you put out attracts the energy that affects you. Why not expect the best? "In the middle of a busy life, take some time to be a kid again." Today's positivity quote is more fun-loving, and came from my fortune cookie! Bad Day or Just 30 Bad Minutes? Don't let something ruin your day that isn't worthy. Be honest with yourself about the reality of what the negatives actually mean in your life. "No" is not the end - it is the next step to the "yes" you are looking for. "How we spend our days is how we spend our lives." Our life is made up of many small moments. We need to prioritize ourselves and our happiness on a daily basis. There's no formula to life - everyone needs to find their own balance! "Always end the day with a positive thought." Painting our day with positivity gives us hope that the next day will be incredible! Innate talent is just potential. Turning it into a skill is actionable. It's not about how perfect things are when you do them the first time, it's about how quickly you can correct those imperfections into a better form. Let's remember the legacy of Martin Luther King Jr. today, and the legacy he left behind that reminds us to stand up for ourselves. How distracted are you by your phone? Try this trick to gain more control over the technology! “Always remember that your present situation is not your final destination. The best is yet to come"
Thursday positivity coming at ya! Believe that the work you put in today is preparing yourself for the fruits of tomorrow. In anything where there is a winner, there is a story behind how that person got there. Why can't that person be you? Well guess what... it can! Sure, the New Year could serve as a nice reminder to focus up on our goals, but it should not negate all of the progress we've made the rest of our lives! As explained in the book "Influence" by Dr. Robert Cialdini, we have a natural tendency to prefer consistency in our behavior. Listen to hear more about it! How do you respond to situations that you dread? Have a longer listen about it today, and be sure to get to the end to hear about an exclusive opportunity! Hardships we experience may leave scars, but scars remind us of the way we grew. Sometimes it's not only okay to copy someone, but it might be a good idea! Mimicry builds rapport through similarity. Phone and technology usage is a problem because we are using it in place of authentic social interaction, rather than as a tool to create opportunities for authentic social interaction. Tip presented by "Back to Human" author Dan Schawbel. There's only one person that can get you to do something, and that person is you! "2019. Just believe that good things are on their way." Huffington Post founder Arianna Huffington managed to level up her productivity when she made one easy change - she got more sleep! Before we kiss 2018 goodbye let's think about how it helped make us who we are! Disrupt your normal routine by adding something totally different! Have a great end to 2018! Do you want to create a new habit? Try using a different habit as a trigger! Control the controllables and don't let others manipulate your perceptions. Learn how one of the best gets his day started! What are the tenets that you live by? It's almost the New Year - time to reflect on your last 365 days and prepare for the next. A great tool to use for that is called YearCompass. "Be like a flower, survive the rain but use it to grow." When adversity and challenge presents itself, weather its effects and let it be fuel for your growth. Turn "Go" Into "Let's Go"
As a leader, you can place yourself by your team's side by using "we speak". Give it a try and see how your team responds. Have an open mind to other viewpoints. Just because you see something one way doesn't mean it can't be seen another. Shake of the week day blues by changing your internal thought patterns! If you want to make something happen, set a goal and an action plan for that goal, then go head down and execute for 90 days. "The past is in your head. The future is in your hands." We can't change the past, but we can create our future! Practice your public speaking and make eye contact by giving your server the attention they deserve. It's not about work-life balance anymore. We can't expect to completely separate the two... now it's about work life integration! Take the time to create a framework that you can use often. It will make you more efficient with your energy and time. Featuring Irene Whalen, we talk about financial responsibility and how to be accountable to keeping your budget. "Give thanks for a little and receive a lot"
Small moments of appreciation can have large effects! As a leader, one thing you can do to earn the respect of your team is to keep them in the loop. Whether or not you use their feedback, they feel validated if they know their voice is heard. It doesn't sound real but hear it out - at the very least you'll have a new way of thinking! This is a very interesting concept and brand new to me. In this tip Stanford MBA Nir Eyal explains how moral licensing affects our behavior, and how we can overcome it. The brilliant Italian reminds us to look beyond immediate pleasure and make decisions that bring us longterm happiness. Thursday positivity this time coming from the renowned Simon Sinek. In this tip he articulates how the way we view our circumstances is our choice, and optimism wins. Take care of yourself at all costs, and that means taking time off to do the things you need to do for your overall well-being. We all have our weaknesses, it's best to identify them so you can overcome them. Admitting fault contradicts our evolutionary biology, but plays an important role in modern relationships and social circumstances. When you are prompted to share what you are thankful for this year, choose something that is personal and has meaning. Trying out a new format but just as action packed - check out this full length interview with Bradley Tusk, and what he shares about his new book "The Fixer: Saving Startups from Death by Politics", as well as his personal maintenance techniques and general impressions. Just like an endothermic chemical reaction, we as humans need to inject a bit of energy to overcome inertia and get moving. Something I really respect about Gary is he always puts things into perspective. Sometimes we get wrapped up in winning in the short term, neglecting what winning means in the longterm. "I don't have time" vs "It's not a priority"
A simple mentality shift will help you take control of your priorities and to-do's. Today people aren't looking to hire talent and credentials. There is a movement to hire people who demonstrate gritty qualities that are more indicative of success. "Karma - think good thoughts, say nice things, do good for others. Everything comes back." It's not too hard to go out of your way to give the best version of yourself to others. And you'll be surprised how quickly those good intentions return. Inspired by the Asch experiment, speak your mind and give honest feedback. If you're like me then you have a negative impression of jealousy. However, jealousy is not envy - it reflects insecurities within yourself that you can correct! Sometimes there is just no replacement for doing things the old-fashioned way. The effort and thought put into a handwritten note can go a long way. Monday - Eliminate Self Doubt Tuesday - Don't Judge a Book by its Cover Wednesday - Check Yourself Thursday - "I am in the process of becoming the best version of myself." Friday - Scream! Sometimes, the best thing you can do is just release that pent up energy! "I am in the process of becoming the best version of myself." Positivity and personal development all wrapped into one! Know that everything that happens to you is part of the larger picture to becoming a better you. Take a moment to assess your current state and mode of operation. Use this time as a personal audit to evaluate your processes and determine if they reflect the person you want to be. Quick judgments are superficial. Get to know someone by learning what they are about at their core, not just how they appear to be. Listen to the 5 techniques the "Charisma on Command" founder gives to eliminate self-doubt: Exercise, find the lesson, filter negative comments, embodiment, and finding your why. Enjoy the recap and have a great weekend! How do you introduce yourself if you are only given 2 sentences? Make an impression by having an organized elevator pitch. "Life is a gift. Wake up every day and realize that." Each of our lives are the result of the smallest of probabilities. Take nothing for granted, have appreciation, and know that you have already won! Just because you are close to achieving something doesn't mean you should think about it differently. Approach challenges with a winner's mentality! Communicate in a constructive way - don't be passive aggressive. Listen to expert public speaker Paul Carrick Brunson share his 5 tips to confident public speaking! Change is eternally around us. We never see or experience the same thing twice. Instead of fearing change, embrace it, as there is no alternative to it. When your life is swept away like a storm, instead of worrying about how you are going to restore everything back to how it was, rebuild it into the way you wanted it in the first place. People prefer things that are neither too novel nor too familiar. You can choose to behave in a way that caters to that expectation. The culture of any good company starts at the top. Listen to founder of Starbucks Howard Schultz's philosophy on team building. How do you wake up each morning? Avoid the snooze button with a custom alarm clock. Figure out what motivates you to get out of bed and use it to your advantage. Address other people before you address yourself in conversation - it makes them feel like the center of attention, and they will be more likely reciprocate and invest in their relationship with you. "A positive attitude gives you power over your circumstances." Use a positive lens and to be critical of negativity and frame your life in a more beneficial way. A great way to stay informed on the happenings around you is to consistently tune into a news briefing. Listen to a few suggestions to get you started! Reaching your goals starts within your mind. Have a vision for how you want things to be and then go out and create it. It's the law of attraction. Using the infamous marshmallow experiment by Walter Mischel, here we learn that having self-control at a young age can lead to future success! Perfection is impossible, especially given man's innate flaws. In order to strive for something tangible, we need to work toward excellence, not perfection. "Stay patient and trust your journey." Another positivity quote - this one is a reminder that the little things add up, and seeing daily challenges in a positive way enables that growth. "Influence. The Psychology of Persuasion"
Breaking down the 6 pillars of persuasion today so we can all be more aware of it in our day - Reciprocity, Commitment and Consistency, Social Proof, Liking, Authority, and Scarcity. What good is knowledge if you can't share it? Sharing value not only is a great way to make an impact, but it is a great personal branding technique, which is a growing requirement in professional settings. I might be late to the party, but I just started using the Screen Time feature in my iPhone. Essentially, it gives me specific mobile usage data that I will use to better manage my time spend on my phone. Have you given it a try? This past week in review! We all hit lows, and that's a part of life. But how do you respond? Have a mentality that let's you overcome life's obstacles. "I think I'll just be happy." Happiness is a choice, and so is positivity. Choose to just be happy today and every day. Thinking about starting a business? Well doesn't it make more sense to pick something that you know and are passionate about? Ryan Robinson, the founder of ryrob.com explains how we can use our own experience and efforts to make things happen! Do you ever feel like you need to defend your position when trying to make a decision? Try sitting next to the person you are working with instead of across from them. This helps mitigate the confrontation in the situation, because concerns and criticism are no longer directed at the other person. This tip comes as something I personally had to work on a lot. Although asking for something might disrupt the peace and create confrontation on some settings, it is important to be able to stick up for yourself and get what you want. Did you know that the two emotions of nervousness and excitement induce identical physiological responses. Prime your brain to choose excitement through self-talk. "I'm too busy loving the people that love me." The full quote - "I don't have time to worry about who doesn't like me, I'm too busy loving the people that love me." You just got to love yours! It is more motivating to follow in the path of something or someone than to long for it alone. This point is best illustrated in Matthew McConaughey's Oscar acceptance speech, and how chasing his hero helped get him to the top. You'll notice this from now on - it is human nature to exhibit a defense mechanism that involves protecting vulnerable areas, essentially hiding your body from that. This communicates certain things to others that indicate a lack of comfortability and confidence, and if you can rework your posture, you will be perceived in a different way. It takes very little effort to treat someone well. Inspired by Drake and the contributions he made while filming the music video "God's Plan", I encourage all of us to take part in our own Kindness Challenge. As contributors to this world we all find ourselves on different teams. It is best that we work well within these teams, and each team relies on each individual to play their own role. Even Kobe Bryant knows that his role is just one piece in the team's overall dynamic. "Believe that something wonderful is about to happen right now." Life is spontaneous, but doesn't that make it fun? The moment you are in right now just might be the moment that changes your life forever. Embrace it! I am going to give this productivity tip a try and I encourage you to do the same - dedicate 50 minutes to undistracted, laser-focused work, then take 10 minutes to tend to all of the things that came up all at once. Coming from the expert salesman himself, Mark Cuban shares about the most important part of sales - believing in your product. I can't express how great mentorship is for so many people. It helps provide guidance in a macro / big picture way, as well as advice in technical specialties. Actually, it IS okay to feel bad for yourself. Just limit those emotions to a 10 minute period, and make a plan to take action! "The best view comes after the hardest climb." This one is personal to me but carries a great message. Having positivity in the moment will help you appreciate the things you have accomplished when it is all said and done. Knowing and respecting history is a necessary component to appreciating your life. History provides perspective, and thinking about all of the people that sacrificed to give you the opportunities you have today, is a really humbling feeling. Pay respects to the things that got you where you are and gain some perspective. Fill your days with opportunities for development that work for you. One simple thing you can do right now is change your password. By incorporating an important or concept in your password, you are forced to repeat that affirmation throughout the day, where it can sit actively in your subconscience for longer. Go about getting things the right way. This means being deliberate in your work, and refusing to take shortcuts. You will reap benefits from this in 3 key ways - your mentality, quality, and efficiency. Instead of making a To-Do list, make a To Be list. Figure out the person you want to be, and reverse engineer the steps you need to take to become that person. It is about doing those things today that bring you closer to who you want to be tomorrow. "Worrying makes you suffer twice." Sharing another dose of positivity, this time referencing worrying. By choosing positivity, you can counteract the cascade of negative effects that come with worrying and stress, and set yourself up to overcome the challenges rather than fall to them. Although it might not always feel like there is a tangible product of your efforts, have faith in the journey, know that everything adds up, and believe you will reap the benefits one day. THAT is playing the long game. Jeff Bezos learned very early in his career and work with Amazon how we wanted to make big decisions. Calling it his "Regret Minimization Framework", he talks about how at the end of the day we are going to regret the things we didn't do, rather than the things we failed at. In practice of Labor Day, I wanted to share a quick message about the real spirit of labor - Hard work. When working hard, it's not just the amount of hours you put in, but the quality of those hours as well. Set the tone for your day first thing in the morning. That energy will translate into productivity throughout the day. What do you do to get your day going? "Create the life you can't wait to wake up to." A dose of positivity today - understand that you have the choice to create your own world, so might as well choose one that enriches your life with positivity! Oooh. Ahhh. Ummm. All of us have speech tics, but it is possible to remove them from your repertoire! Kim Kaupe suggests recording yourself to identify your speech tics and bring them into your awareness. A lesson from the late John McCain - "Nothing in life is more liberating than fighting for a cause larger than yourself.” If you aren't in a position to dedicate your life to a larger cause, you can still aid in the fight by making decisions that contribute to the cause in a more simple way. Hear from Seth Godin about how he discovers inspiration and finds ways to produce quality written content. All of the resources, tips, and tricks are futile if you don't take action. There's a reason it is called PERSONAL development, it is something you must do on your own. In order to set boundaries, you need to first think for yourself and what you want. The best way to do this is to set your boundaries in an unemotional state that accurately reflects your desires. Reflecting on an article I wrote that was published by Addicted2Success Magazine, I realized the concepts had applications everyday. The 5 skills I learned while abroad - Build relationships from nothing, gain self-awareness, take ownership of poor results, independent problem solving, and trust your instincts. Mel Robbins describes a simple 3 step process to overcoming procrastination-related behaviors. First is to forgive yourself, second is to look from the outside in, and third is to engage in a starting ritual that helps you take action. Give more than you take - Give 51%, receive 49%. It will do wonders in your relationships and the way you view yourself. It is the Gary Vaynerchuk way! Love this clip from Jim Carrey, who shares his take on fear, life choices, and doing what you love. Set goals that are: Specific, Measurable, Attainable, Realistic, and Timely. By doing so, you will be set up for success in whatever you choose to do! A Sales Technique - "Did I Explain That Well?" In sales training, I was taught this communication technique to be more effective when clarifying a point. By placing the potential for misunderstanding on yourself, you give your client more opportunities to be honest about their decision making process. Listen to find out why! What is the quickest way to the top of any company? Help out! Stay late, volunteer for tedious tasks, and be the extra hands on a project. The gesture will not go unnoticed. Having trouble being organized with your creative process? Try creating a vision board. Get all of your ideas out in front of you so that you can create associations and focus your energy on the task at hand. Inspired by Mel Robbins, this tip is about taking time to support others. By being their biggest fan, their support will be reciprocated and the quality of your life will improve in all areas. Don't hesitate and act! The longer we wait, the more we rationalize our urges and reject the idea of doing something new. This is because or brains are hardwired to avoid uncertainty. Move fast and beat it! The Eisenhower Matrix is a decision making matrix built around two things - how urgent something is, and how important it is. If it is urgent and important, do it now. If it is urgent but not important, delegate it. If it is not urgent but important, schedule a time to do it. And if it is neither important nor urgent, eliminate it! The expression "What If" is filled with doubt. Why demote yourself to that? Instead, replace "What If" with "So What" and see how your approach changes when making decisions and considering options. Priming is when factors in your environment create a disposition to think a certain way that usually occurs outside of conscious control. Use the power of priming to change your mentality to a point where that association is natural. This is a life choice - instead of seeing fault in other people, decide to assume the best of intentions in everyone around you. You'll be surprised how the way you perceive your own life transforms. This one goes against the grain for a lot of people but it is important to hear. As great as accountability is when setting goals, telling everyone about your goals could be doing more harm than good. Listen to hear why! This topic comes from a popular TedTalk. Doing something new, and out of our normal routine, wakes up our brain from autopilot and helps us process and appreciate the time that we are spending. Do something out of your way today! This one is kind of a buzzword these days, but it's real! Practicing gratitude brings many positive effects to your life, and it is very easy to do. What are you thankful for? Looking to incorporate a little more exercise into your day? Make the conscious decision to park in the back of a parking lot and walk to your destination. Small workouts throughout the day serve an important function in your metabolism and body's maintenance. Give it a try and not how you feel! Life is very competitive, and sometimes it is impossible to compare yourself to those around you. Just know that anytime something happens, it is adding to you and what you offer, and never subtracting. Listen to this story from Jay Shetty to understand why that is true. Ready for a small act of courage? Decide to go first, whether that is in a presentation or in a Q&A session. It takes a certain confidence to do it, and practicing that skill will turn it into a longer term mentality! Curiosity is a powerful motivator of human behavior. Learning why it is effective, and how to best leverage it in your life, will lead to deeper relationships and more impactful moments. Our goal orientation works in one of two ways - we move toward our goals, or away from them. Avoidance is defensive to minimize risk, while approach is welcoming and optimistic. Framing your mind to approach your goals instead of avoid your goals will lead to something great! Ever feel like life is falling apart? In those emotional moments, try this technique - writing down and revisiting your issue helps address the issue face on, while providing perspective that life will go on. Revisit the issue in a few days, weeks, or months, to bring the process full circle. We are all accomplishing a lot more than we think we are, take time to reflect on those areas where we are succeeding! Real success comes from doing the little things right, and the 80/20 Rule states that practicing and focusing on the 20% that you really need to be successful with 80% of your time will lead to results! You don't need to stop working on the things that you love. Stay in touch with your passions and the rest of your life will fall into place around that. Mindfulness has the capability to improve the quality of your life, increase focus, and decrease stress. However, we often aren't practicing it right. Phil Boissiere's 3x3 method is the most practical solution - pick an object, state it plainly, and take a deep breath. Do that 3 times. Hindsight bias is a psychological phenomenon that misrepresents reality. We note time when particular things happen, and forget all of the times when it didn't happen, and have a distorted perception of reality. Eliminate hindsight bias by practicing objectivity and seeing things for how they actually are! Did you know that will power acts like a muscle? It fatigues with use and can be strengthened with training. There are two great ways to raise your will power threshold - "Warming Up" and "Conditioning". Tony Robbins, debatably one of the most efficient and productive people on this planet, engages in the same morning routine every day. It's a 10 minute routine that primes him for success - 3 minutes of gratitude, a 3 minute prayer for family and friends, and listing his 3 goals for the day. A corny tip but I love it - at the end of a workout, when you feel that endorphin rush and the satisfaction of completing your exercise, put your arms up like a champion boxer. This positive body posture will feed your momentum and energize you to stay productive. If you want to make something happen, you need to unequivocally believe that it will happen. The law of attraction has been adopted by stars like Denzel Washington, Oprah, and Conor McGregor. Believe in something so much that you will it into existence. Let yourself pause and understand what your conversational partner is trying to tell you. Silent moments are indicative of the quality of the exchange. The best things in life aren't earned all at once. Fabio's quote "I don't really know what I am doing but I know that what I am doing is leading somewhere good." Let small things compound and open doors, and believe that it will all work out. What do you really prioritize? Formalize those things into core principles so that they can serve as a cornerstone for your decision making process, and ensure that your activity aligns with the person you want to be. Katie Wallace shares 10 ways you can start living a more sustainable life, starting today. Learn the true definition of sustainability and the best ways to think about sustainability - people, planet, and profits. Your actions are a better indicator of your intentions than your words are. That's why we say "Let actions speak louder than words." Put your intentions on display and let your actions speak through random acts of kindness or letting someone important in your life know you care. A valuable piece of personal branding real-estate that we often overlook is our email signature. It is a place where we can direct people in our network to areas where our personal brand is on display. If you're not actively building your personal brand, then you can still use this space for affirmational or optimistic benefit! When trying to uproot a habit, and resist the urge to act, a simple word switch will go a long way. Replacing the word "can't" with "don't" implies a commitment that will help you make that change! Wearing red is associated with more self confidence and more perceived attraction. Keep this in mind for a special ocassion or big moment, and give it a try. Let us know how you feel! Exercise is an important part of keeping your body in the right shape to perform. But did you know that frequency of exercise is just as important as intensity? This is true even within the same day! That's why incorporating exercising opportunities is so beneficial to your health. One choice you can make today - take the stairs. Who else thinks that we are a little too addicted to our phones? It makes sense, it is a comfortable and reliable place. But too much of anything usually isn't a good thing, and this is no different. Try extra hard to resist the urge to check your phone the next time you are in a low-stimulus situation! The safest place for you to invest, financially, emotionally, and physically, is in yourself. You can this through education, apprenticeship, and taking care of your body! This is a great way to add a new habit to your repertoire. By using a previous habit, you can add a new habit simply by anchoring a new habit to that old habit. Use that first habit as a trigger to do the other. The first step to getting comfortable being uncomfortable is exposure. But that doesn't need to happen all at once, you can introduce subtle changes to your routine that will help you improve in uncomfortable situations. Things you could try are setting your wake-up alarm for an odd time, or brush your teeth off-handed. This tip applies for just about anyone who has ever felt like they were busy but didn't get anything done. Kim Kaupe suggests you split your to-do list into things that are important and and things that are urgent. Tackle a few in each category for a productive day. Our brain and thought patterns largely influenced by the way we feel and perceive things. Therefore, treating ourselves in a way that sets us up for success is should be a priority, and we can do that by priming our brain to feel a certain way. Embrace adversity because it is a blessing in disguise. Practical resilience is the concept of having the mental thought patterns to overcome challenges. This is explained more in Tofe Evan's book "Everyone Has a Plan Until Sh!t Hits the Fan". Have you ever benefited from something somebody did out of the goodness in their heart? Sometimes they do this for a very simple reason - paying it forward. Doing something for someone else with no expectation for anything in return is a great way to be self-reflective and provide perspective in your life. The friendliest form of competition is competition with yourself. It is the truest spirit of self-improvement, and motivates you to be better than you were yesterday. This tip features great video from Addicted2Success that demonstrates the power of self-competition. We all can afford the time to take a phone call with someone in our network. Even if it comes from a place of mentorship, these conversations keep you sharp and you always learn something new. Give it a try! Influence is a byproduct of the value you are using to serve an industry or individual. It comes about by doing things for the right reasons - with good intentions and the right motives. To test this, pick someone important in your life and ask yourself the question, "Are they proud of the reasons why I am doing this?" Monk Gaur Gopal does provides some real perspective in this one. "Whether you're flying economy or you're flying business, the destination you are heading remains the same doesn't it." "We work ourselves up so much in increasing the standard of living that we forget to increase the standard of our life". To all my pack-rats, hoarders, and collectors, simplifying your situation brings great value to your life. It allows you to live more in the moment while decreasing stress, boosting concentration, and helping you sleep better. Remember those possessions digitally and clean up! One way to stick to a commitment is to use interpersonal accountability. Three techniques to create this accountability are sharing your goals with someone else, having a Peak Performance Partner, or sharing your ambitions on social media. Asking for help is strength! It's an expression of confidence and makes you more relatable as a human being. The only way to truly extrapolate the value around you is by leaning on their experience and asking for help. Sales is all about offering value, and in this tip, Fabio Marrama does a great job explaining why. To leverage that, you need to sell the benefits, or the outcomes! This is a really good one from Mel Robbins about If-Then planning. Basically, when you have identified a negative thought pattern, you can plan ahead to substitute a behavior with something more beneficial. This technique is 60% effective! First described by Anders Ericcson, deliberate / purposeful practice is a 5 step process that can create anyone into a master at some skill. Captivating speaker and public figure Simon Sinek shares what he believes is the most important part to a speech - the story. When doing this right, you can set the tone for the rest of the presentation. We all have deficiencies in our lives, and that's okay! Stephanie Hall's tip reminds us to embrace our strengths and execute accordingly. Take advantage of your down time by learning a foreign language! Duolingo is an incredible resource that gives many people access to education. Inspired by Luis Von Ahn and the Duolingo team and their efforts to even the playing field! In a business setting, a great display of respect is to stand up when someone enters the room. Although you might stand out when doing this, the act really does portray a lot and is great for first impressions and relationship building. It is important to reflect on times you failed when identifying room for improvement. This tips proposes that you turn outward when rationalizing problems and ask the question "Why?" 3 times to get to the root cause. Then you're in a place where you can manage the problem appropriately. This tip comes from Charlie Houpert and his YouTube channel "Charisma on Command". In the show he explains how Chris Pratt is a comedic genius, and how it all stems from the way he chooses to perceive situations. Simply, by placing a positive spin on everything, you can open the door to comedic brilliance and general charisma. Learn how to deal with embarrassment or certain emotional situations by taking a deep breathe, smiling, and saying thank you. It increases the way others perceive your self-confidence and establishes rapport. Tony Robbins is an incredible person because his behavior is built around incredible habits. Every morning he does the same routine that includes 3 minutes of gratitude, 3 minutes sending love to people, and writing 3 goals down for the day. Write down your 3 goals for the day. It helps provide direction for you and a tangible way to evaluate your productivity in the day! Performing "How Do I Feel" Checks allows you to get a good sense of your mental state and find any small problems before they grow into big problems. Find a solid trigger that will help you engage in the behavior multiple times a day! Mirroring is when we replicate the behavior of someone else. This from an evolutionarily perspective has played a huge role in relationship building because it is an indicator of similarity. By being aware of the role mirroring plays in conversations, you will be better prepared to have better conversations! Inspired by "Sprint", prioritizing tasks 1 to 5 helps you become more productive and helps you transition between tasks. As a content marketing and strategy expert, Kaya Ismail shares the importance of organization and planning within his industry. However, his core lesson revolves around the importance of having good organizational habits that translate in all areas of business and life! Find time to make your dreams a reality. Your option - 9 PM to midnight! Today's tip reveals the health benefits of having close friends, and encourages us to get back in touch with those who are important to us but no longer are convenient to hear from. In a stressful situation Mark Metry prescribes 6 deep breaths. By doing so you activate your parasympathetic nervous system to elicit a calming response. It is simple - make your bed every morning. By doing so, you set yourself up for success by completing the first task of the day, and having it as reference when other things don't go right. This is an old Marine lesson shared first by Admiral William McRaven. Write down your short term and longterm goals every morning in present terms. Whatever you want to be, profess it as true today and let your psyche do its work! Innately we are already limited in how much information we can retain and recall. In a conversation, a lot of the information shared is not remembered by the recipient. Active listening, instead of listening with the intent to respond, increases recall and leads to better quality conversations. Jake Jordan shares that we lose a ton of time everyday because of distractions, and suggests that we are smart with the way we do spend productive time. This comes in two forms - time blocking and scheduling every minute of your day.